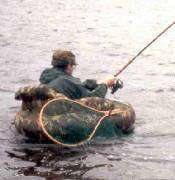 A jig is a weighted hook with a lead head opposite the sharp tip. They usually have a minnow or crawfish or even a plastic worm on it to get the fish's attention. Deep water jigs used in saltwater fishing consist of a large metallic weight, which gives the impression of the body of the bait fish, which has a hook attached via a short length of kevlar usually to the top of the jig. Some jigs can be fished in water depths down to 300 metres. 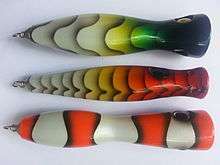 Spoon lures usually look like a spoon, with a wide rounded end and a narrower pointed end, similar n shape to a concave spearhead. They flash in the light while wobbling and darting due to their shape, which attracts fish. LED lures have a built in led and battery to attract fish. They use a flashing or sometimes strobing pattern, using a combination of colors and leds. Swimbait is a soft plastic bait/lure that resembles an actual bait fish. Some of these have a tail that makes the lure/bait look like it is swimming when drawn through the water. 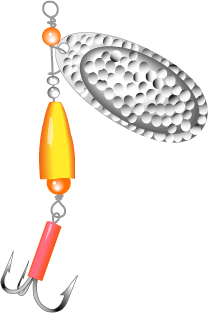 Wikimedia Commons has media related to Fishing lure. ↑ "History of the fishing lure". Madehow.com. Retrieved 2013-06-16. ↑ Light, Dynamite. 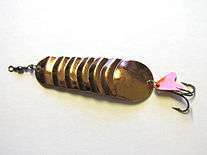 "Dynamite Light The LED Lure". dl-lure.com. Retrieved 2016-03-30. ↑ Daniel Pauly; et al. "Fishing Down Marine Food Webs". Seafriends.org.nz. Retrieved 2012-02-24.